Mont Blanc – All Tickets Inc.
Mont Blanc’s wonderful food and pleasant atmosphere make this restaurant a favorite place to dine. Located in the center of the theatre district, Mont Blanc is a truly special restaurant offering a range of finely prepared dishes. Able to accommodate your group prior to a matinee or evening performance, the cordial wait staff will be sure to facilitate your stay, ensuring that every detail is attended to and that your dining experience is perfect. For lunch or dinner, choose from various appetizers, including luscious Herring in Sour Cream or their Pate de Jour. Lunch dishes include tender Viennese Veal Dumpling, light Omelette a la Francise and a very special Spinach Linguine with Pesto Sauce. Dinner entrées offer more variety, including the beautiful combination of Linguine and Farm Raised Manila Clams or the enchanting pasta dish Farfalle Delle Stagione. Lunch and dinner include vegetables, potato, dessert and coffee or tea. Your group certainly will have a great time at Mont Blanc. 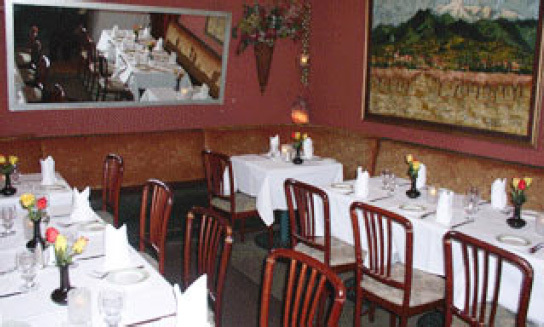 The cuisine is first rate and the ambience encourages relaxation and pure enjoyment. With an international menu, Mont Blanc is sure to please all.